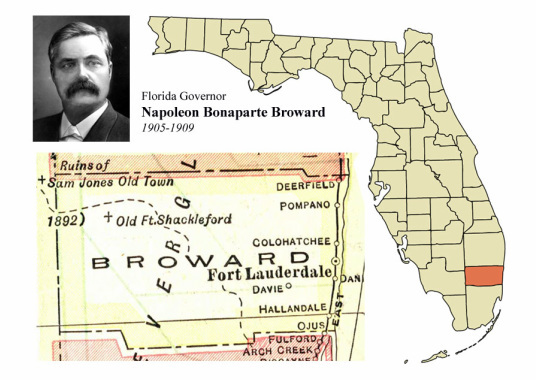 April 30, 1915: Broward County created, named after former Gov. It was supposed to be called Everglades County, which would have been a much cooler name. But in 1915, as the Florida Legislature prepared to vote on a bill to create a new county out of chopped-off portions of southern Palm Beach County and northern Dade County, the Speaker of the House amended the bill to name the new county after former Gov. Napoleon Bonaparte Broward. It was Broward, a former riverboat captain from Jacksonville, who had based his 1904 campaign for governor on the need to drain the Everglades in South Florida for agriculture and residential development. Satellite view of today's Broward County, population 1.8 million.